Shh. Let the sound effects do the talking this time. Or maybe you already have, and we would NEVER KNOW (until the next day). Oh yes. 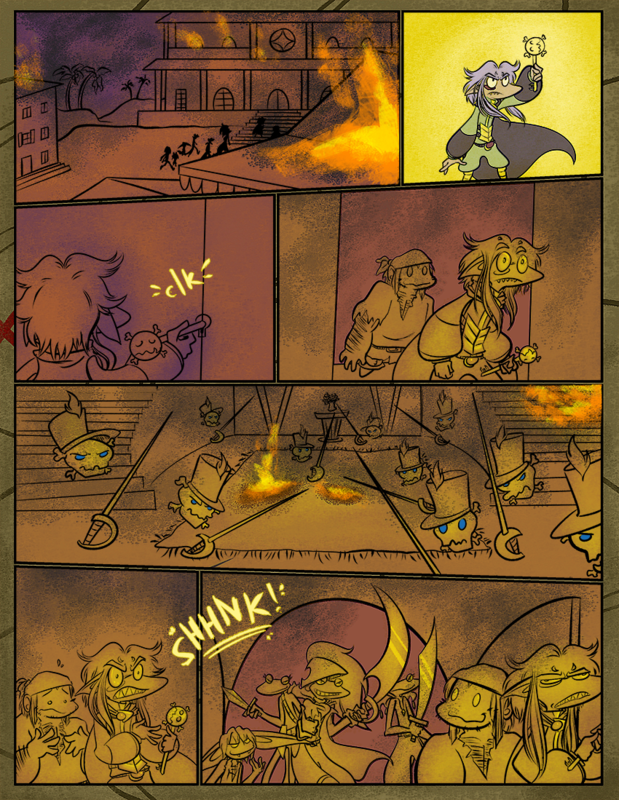 There is actually a tiny hint on this page, which if you really thought about, would reveal the secrets as to why our main antagonist has a permanent black eye, why the curse was actually placed, and where Lorelei came from. It’s quite a clever little detail, but you better find it now because I’m about to edit it out forever. i really hope you haven’t changed it yet or all my screenshots will be for naught….. I haven’t really seen any websites pulling April Fool’s shenanigans yet, save for DA’s little “thoughtart” thing. Let’s all pretend that my comment was a reply to yours on purpose. Dat Skärva face in the last panel. Eh, April fools day pranks are too expected (a bit cliché too), I think. This is why if I do them, it is a few days before or after. Gets people good. In my opinion, when websites or whatever don’t try to actually “fool” people and use it as more of an excuse to mess around and be silly, it’s better. Like Google Maps’ Pokémon finder. So I could say something like “We’re tired of making this comic. It’s over. Sorry, guys!” but that’s lame. I’d need to come up with something better. I’d like to someday, it’s just that I always forget or never have time. Seriously Skärva, the faces you make. I imagine the Pirates won’t be much of help in the next pages due to be drunk. On the one hand, perhaps they’re used to it. On the other, drunken swordfights are still not a great idea. And most of them probably have a higher tolerance for risks considering the extent of their regeneration ability. That poor Lurkin better watch his ears. Is Skarva’s ability to move eyes like that part of the curse? Nah, it’s just the sudden contrast between the excitement he felt around this kidnapping mission, to realizing he’d have to fight side-by-side with pirates again, caused such a change in enthusiasm pressure that he’s slowly deflating, causing bizarre face deformation. I love Derk’s expression in the second to last panel. Like he just discovered he has chest hair. It was more looking at his hands like “I dunno how much magic I have left”, but yes, every day Derk is astounded anew at the hairiness of his own form.